Total Home Supply has recently introduced a new line of indoor electric fireplaces to their website, just in time for consumers to begin to prepare for the fall and winter months. It’s safe, cost-effective, energy-efficient, and suitable for any living space, regardless of building regulations or layout. Classic designs reimagined for the modern-day consumer, Dimplex electric fireplaces offer all of the heat, light, and ambiance of traditional wood- or coal-burning fireplaces, without burdening the consumer with the extra cost, concern, or effort it often takes to use and maintain an actual-fire unit. Total Home Supply is thrilled to announce their new partnership with Dimplex, whose innovative line of heating and lighting units consist of wall-mount and plug-in fireplaces, fireplace inserts, fireplace and mantel packages, and freestanding fireplace stoves. In lieu of a real fire, Dimplex’s patented LED technology utilizes electric light and reflective mirrors to create the illusion of bright orange, dancing flames. Some units feature this remarkably realistic electric fire atop a stunning glass ember bed or an old-fashioned bed of molded, coal-like rocks, but most units feature Dimplex’s handcrafted, pulsating ember log set for a gorgeous, rustic look and added realism. All Dimplex units are also 100% energy-efficient and made to operate at minimal cost, a smart choice for both the consumer and for the environment. 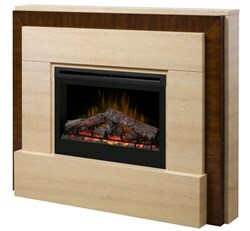 An impressive variety of Dimplex electric fireplaces is now available at TotalHomeSupply.com.